Timiş (engl. Timis) is the most western county of România. In Hattrick this region has the ID 1528. 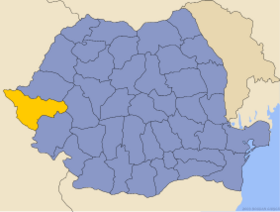 Timiş is the 5th most popular Romanian region with 3.1% of total Romanian Hattrick managers whereas only 2.95% of Romania's population reside here. This region wasn't from the very beginning of the Romanian Hattrick league so the oldest managers from Timiş played in some other regions before. No team from Timiş won Divizia A or the Romanian Cup yet but we can't wait to add something here as soon as possible. Still, FC Kag (34253) was in serie II.3 in romanian season 7 and in II.1 in Romanian season 11 while Larry Fotbal Club (34571) succeded to stay in serie II.2 in Romanian season 14. Also, FC Kag (34253) made it up to the semifinals of Romanian Cup in Romanian season 14.